Today was a free day- no appointments and no grandchildren - so I wrote out my to do list with more on it than I usually try to get done in one day. Surprisingly and happily, I got it all done my mid afternoon. Scratching through completed jobs on a to do list is almost as satisfying as finishing a job. The biggest job today was mowing and edging the front and back yard. Cooler temperatures and a nice breeze made this job easier. 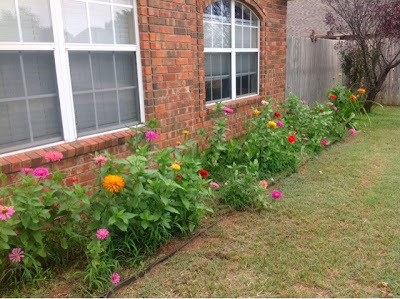 Here are the jumbo zinnias in the front flower bed - but please just look at the pretty flowers and ignore the grass growing around them, the weeds flat got away from me from this year. And changed my Jamberry nail stickers. This is my second time applying them and I really like them but there is a bit of learning curve involved. The second time was much easier and faster than the first. Supper will be leftovers from Sunday along with some fresh tomatoes and cottage cheese so that meal won't take much time. I also got out this sampler and zigzagged the edge of the linen so it won't fray while I stitch it. I plan to start stitching it this evening. I am already thinking about tomorrow's list. Clipping and filing yesterday's coupons will be on it as well as straightening the 3 extra bedrooms and bathrooms. I hope you have had a productive Monday too! 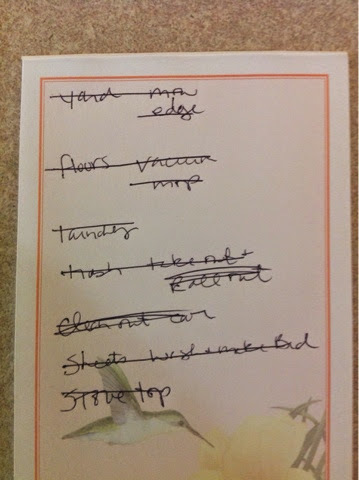 I agree that crossing items off the list is very satisfying! I had no dirty laundry today until hubby came home and changed. Oh well, I will take even if it just for an afternoon! Those are some beautiful zinnias and I don't know many that can constantly keep up with the weeds. :) We are experiencing the cooler temps also. Now if only rain chances would be removed from the forecast so I could stain or paint. Is it weird that I feel your joy and satisfaction about getting so many things done today?? My day has not been quite as productive as yours, but I SO relate to the feeling of satisfaction. I write things on my list AFTER I have done them if I hadn't already. I want that joy of crossing it off! Your flowers are lovely and I love the saying on your sampler. Hope we get to see it finished. Oh my gosh, those zinnias are awesome! Mine have never been so big and beautiful. 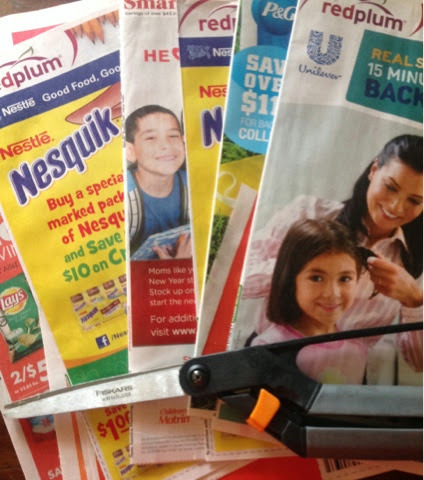 I clipped all those coupons yesterday, and that job alone made my feel super productive. I just harvested 4 huge zucchini, so I made zucchini cakes, and I have 2 loaves of chocolate zucchini bread in the oven. Your list is super impressive. I totally agree with you about marking things off the list. Sometimes-- I forget to make my list, so I just get cracking on the mental list I have in my head, then I write it all down at the end of the day! I find that very satisfying too. Especially, on the days when I sit down and wonder... WHY AM I SO TIRED? WHAT DID I DO ALL DAY? then I look at my completed list and sigh a sigh of relief! Wasn't it nice to have a day all to yourself? I had physical therapy this morning, which takes almost 3 hours of my time (including driving). Got home and made scrambled eggs, bacon, and toast for Tim (he was home this weekend). Then cleaned the whole house - vacuuming, dusting, cleaning the kitchen and bathrooms, running the dishwasher, watering plants, cleaning cat boxes, and doing 3 loads of laundry. Now I'm off to make dinner. Tomorrow is errand day - yuck. I usually have a list too....but this morning I knew I had to wash the windows, inside and out plus the screens..and so I did that and while I was at it, cleaned the blinds and window tracks! 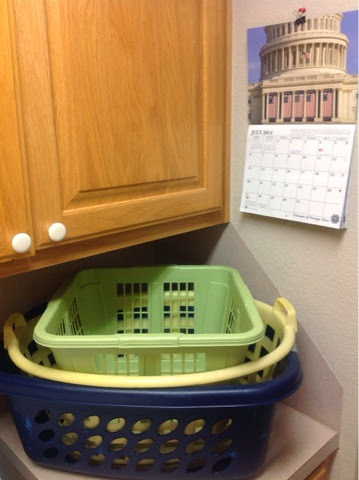 Did a load of laundry, hung that out, and it is so hot here (Northern CA) the clothes dry pretty quickly, so brought them in, folded and put it away.. I feel your satisfaction in crossing things off the list. My Mondays are always spent working so I don't plan anything until Tuesday. That's when I have a list a mile long. Although my plans will be thwarted tomorrow, a long time favorite Mennonite bulk food store is going out of business and everything is 25% off. When I get back from there I will begin my chores. Your flowers are gorgeous and you have inspired me to drag out my stitching. Don't you find it relaxing? I love being able to mark things off too. I have weekly list with items on their for Allen too. Some weeks very little if any go off and others all is done. If I do stuff not on it I put it on so can be marked off! Love your zinnias! We normally plant them but the spring was so wet didn't get any out. We now have stuff planted for a fall garden in hopes of getting green beans, and pickles to can. Our temps are to be in 70' and 80's this week with nights at 50's and 60's. LOVE it but wish I was off. Won't be till Saturday. Not so productive around here besides a couple loads of laundry, taking care of dishes, and two trips to town for Silas to go to the dentist. Yes, I thought his appointment was at 10, but it was really at 2. Sigh. We took advantage of the nice morning to check out a couple of antique/flea market type stores in town, and playing in the park, so time well spent. Tomorrow I'll have quite a long list. You're just like me with your lists...oh I do get a sense of satisfaction in crossing things off! Leftovers for dinner with a few things to round it out....one of my favorite things and such a time saver! Yum! I have a new chore to add to my list: a baby calf to feed three times a day! Monday I froze lima beans for my daughter, this morning I sprayed Round Up around the house and flower beds. I love crossing things off! Rhonda ~ I read your blog quite often, but I've never commented. This morning, however, I was getting caught up on my reading, found this post and couldn't help but smile. 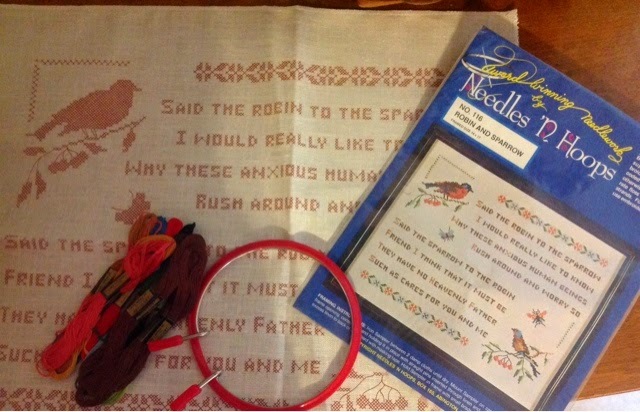 I stitched that very same sampler...oh, probably 45 or maybe even 50 years ago (gulp, is that possible?) and recently had it re-framed. I love it to this day and I'm sure you will too. Hi Melinda, so nice to meet you :) my mom stitched this very same sampler about 50 years ago for her sister. I have always liked it and finally found a kit for myself on EBay. I am so glad you have one and still enjoy it, it really is a sweet poem, isn't it?